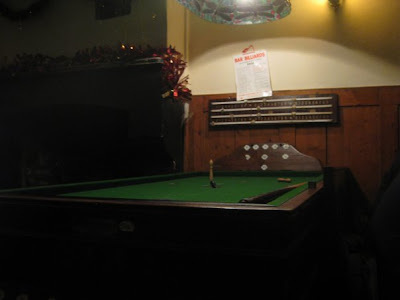 The Hope and Anchor on Tottenham Lane has a Bar Billiards table. Bar billiards is ace. We have a few suitably-equipped pubs listed on RGL. The Glasshouse Stores on Brewer Street has a table too. There is one at the King Charles I near Kings Cross Station, also a lovely pub with decent music. We played the excellent Bar Billiards table at the King Charles I pub last night. Great fun in a great little pub. You wouldn't think you were in London there. They've also got Shove Ha'penny in there, I'll be giving that a go on my next visit. The All England Bar Billiards Association has a very useful map of tables on their website.